Publishers: Y'all are smart. You've figured out that one of the hottest ways to get pre-order sales for a video game nowadays is to offer early access. Not Steam Early Access, per se, but letting your pre-order customers start playing the game early. How did it take us 2,017 years to figure this out? The Elder Scrolls Online: Morrowind is about to take advantage of players' excitement with this head start scheme. Purchase the Morrowind Upgrade or the Physical Collector's Edition and you'll be stomping around ESO: Morrowind a full two weeks earlier than your non-pre-ordering friends. Suckers! While they're biting their nails, waiting for the June 6 launch, you'll already be all up in there on May 22. Physical Collector's Edition [no pricing yet, but it comes with a 12" Dwarven Colossus statue so, pbbbbt, it'll cost something]: This premier edition is for the ultimate fan and includes the Discovery Pack, all premium digital content—a bunch of stuff, trust me—The Elder Scrolls Online base game, and a bunch of exclusive collectibles. Digital Collector's Edition, $79.99: This edition includes the Discovery Pack, The Elder Scrolls Online base game, plus unique in-game items. Digital Collector's Edition Upgrade, $59.99: If you already own ESO, you can still obtain the in-game items described above in addition to the Discovery Pack and Morrowind itself by choosing this upgrade. Standard Edition, $59.99: Pre-ordering this edition will net you the Discovery Pack, plus the full Elder Scrolls Online base game. Morrowind Upgrade, $39.99: If you're just looking for Morrowind and already own ESO, this upgrade is what you're looking for. Don't forget if you pre-order, you'll still get all the items from the Discovery Pack. Again, it's that first one, the Physical Collector's Edition, and the last one, the Morrowind Upgrade, that'll get you in the head start. Since baseline ESO retails at $29.99, that plus a $39.99 Morrowind upgrade runs about $70. Unless you find a deal on vanilla ESO, that's the cheapest you'll get away with this whole start-early thing. The Elder Scrolls Online originally launched with a per-month subscription model in 2014. A year later, in 2015, it became pay-once-play-forever, renaming itself The Elder Scrolls Online: Tamriel Unlimited. TESO: Morrowind—along with the rest of vanilla ESO—takes place 600 years in the past, but is still based on 2002's The Elder Scrolls III: Morrowind. 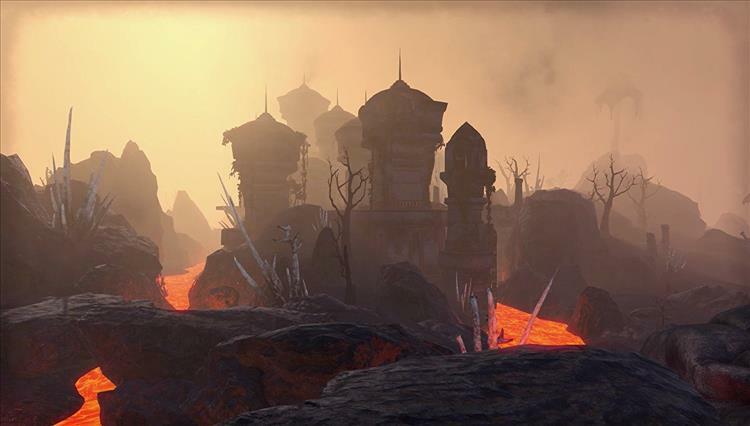 It’s almost time to return to Morrowind in The Elder Scrolls Online: Morrowind, and today we have exciting news for existing PC and Mac ESO players. ZeniMax Online Studios has revealed that PC and Mac players who purchase the digital upgrade version of ESO: Morrowind, or the Physical Collector’s Edition, will have the option to begin their adventures in Vvardenfell a little early – starting May 22 – via a special “Early Access” launch of the game. New players purchasing the full ESO: Morrowind game for PC/Mac will begin play on launch day -- June 6. Whether starting a new Warden or bringing their existing heroes over to Vvardenfell, PC/Mac upgraders will have a two week jump on the epic storylines and new areas in the massive new Chapter. The “Early Access” period will allow for final gameplay tuning and polishing before the game launches for everyone in June. The Elder Scrolls Online: Morrowind will launch on PC, Mac, PlayStation 4, and Xbox One on June 6. For more information, or to pre-order the game for a variety of in-game and other rewards, players should visit www.ElderScrollsOnline.com.